I’m a big fan of comics of any kind, but if there’s some history trow in, I’m always happy. This series by Jacques Tardi was, for me, a great way to get to know the city of Paris. 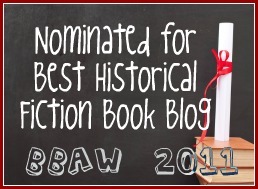 The stories are always filled with mystery, suspense, history (obviously!) and many eccentric characters. Adéle Blanc-Sec is an independent young woman who leads her life as she wishes, not being afraid of social conveniences. She’s a freelancer writer who enjoys a good mystery and finds herself involved often in some incredible stories involving paranormal, murders, science,… Most stories are set before the WWI and after avoiding the war conflict. 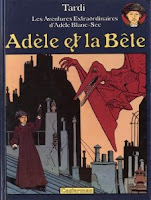 The first volume of this series is Adèle et la Bête (Adèle and the Beast). A Pterodactyl escapes from a museum and everyone who sees him dies immediately afterward… Our heroine decides to solve the mystery and collect at the same time the government’s reward for the capture of the animal. But everything is not what it seems and Adèle loses someone close to her in this adventure. Adèle Blanc-Sec is a very cynical heroine who never hesitates to give her opinion or simply do what she thinks needs to be done. This first volume introduce us several characters who are simply too delicious to miss. Jacques Tardi has a real talent to bring them alive and make them so real that you simply cannot help but wish you were also part of these adventures. Normally, everything related to dinosaurs puts me off but the story is fast paced and very well written. The author’s drawings are just perfect for these stories, I could never imagine them otherwise.